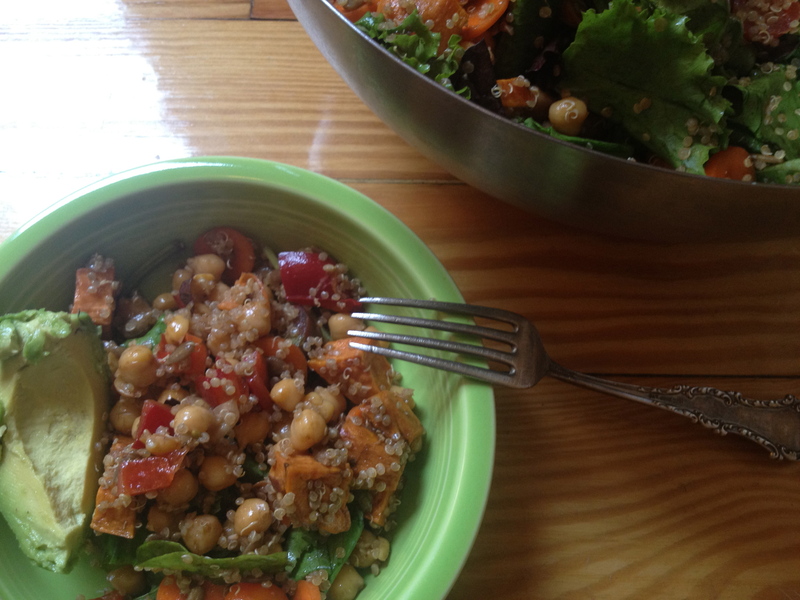 Chickpeas, quinoa, and yams, Oh My! 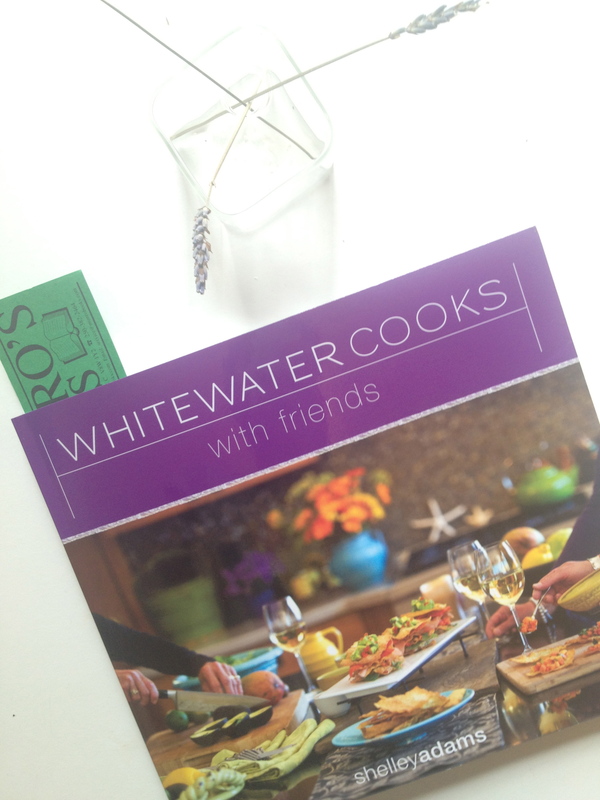 My dear friend Sarah recently sent me a gift in the mail: a cookbook entitled Whitewater Cooks with Friends, by Shelley Adams. Whitewater Resort is nestled in the Rockies in Nelson, British Columbia, where Adams is head chef. The book is special for me as someone who lived in B.C. for a couple of years and loved the simplicity, freshness, and local delicacies (Nanaimo Bars!) of Vancouver Island and beyond. I love flipping through the book for the photos and the comments like “Buying good quality pasta sauce, pasta and homemade sausages is totally worth it. Go to Star Grocery in Trail, B.C. and ask for Pasquale!” Or, “Think ‘classic’ and we think Petra!” And, for the broccoli salad, “Test driven on many a Kootenay kid!” Sarah recommended I try the chickpea, quinoa, and roasted yam salad; it’s the first thing I’ve made from the book. I couldn’t help tweaking the recipe a little (I’m a tinkerer), so I tailored it to August and my local farmer’s market, adding local cherry tomatoes and sorrel, and cooking the chickpeas rather than using canned. 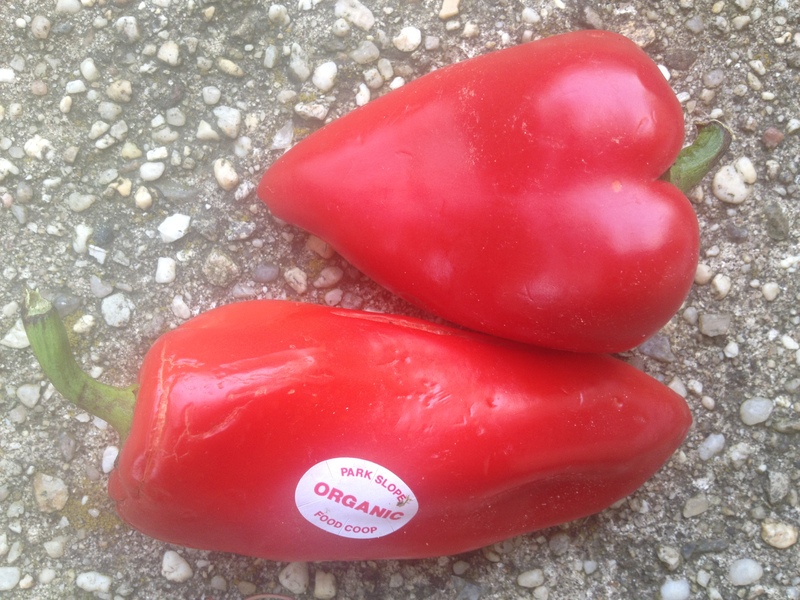 I added some heat by using a pinch of hot red chili pepper flakes. I can’t wait to eat this all week for lunch, adding avocado or more greens along the way. Feta would also be great in this but I left it out this round. You can have fun with this recipe and substitute according to your tastes, the season, and what you have on hand. I ended up with a lot of leftover chickpeas—I cooked too many—so made a quick hummus. I blended the cooked chickpeas (along with the onion I had cooked them with), one roasted red pepper, a clove of garlic, some lemon juice, olive oil, sesame seeds, salt, and pepper. *If you’re using dried instead of canned chickpeas get cookin’! You actually want to soak your chickpeas in plenty of cold water overnight, or at least 4-6 hours. Drain the soaking liquid. 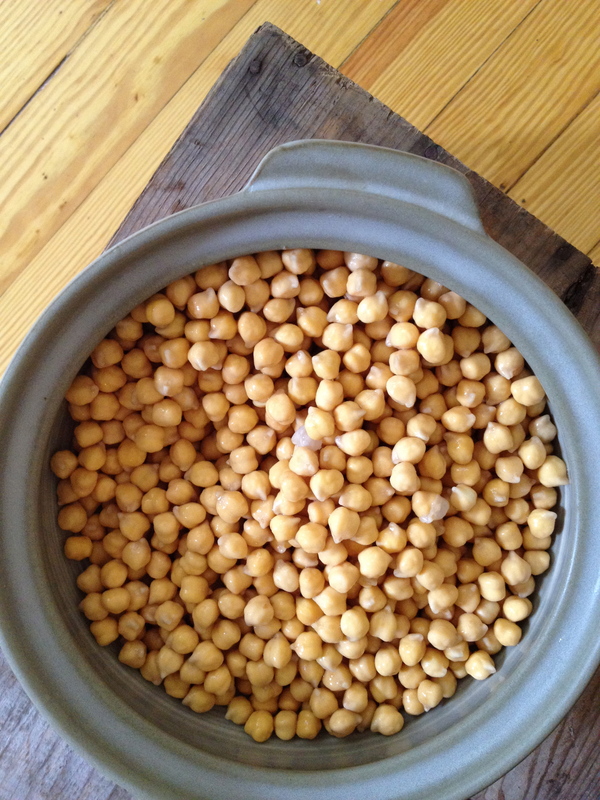 Transfer chickpeas to a large pot and cover with cold water. Bring to a boil. I added an onion, cut in half, mustard seeds, black peppercorns, fennel seeds, and 2 juniper berries. Cook the chickpeas on medium-high heat for about 45 minutes or until fully cooked. Drain the hot water and let cool completely. Place the quinoa and 3/4 c cold water in a saucepan and bring to a boil. Reduce heat and simmer for 15 minutes. Turn off heat, leave lid on, and let stand for 5 minutes. Cool the quinoa on a baking sheet. 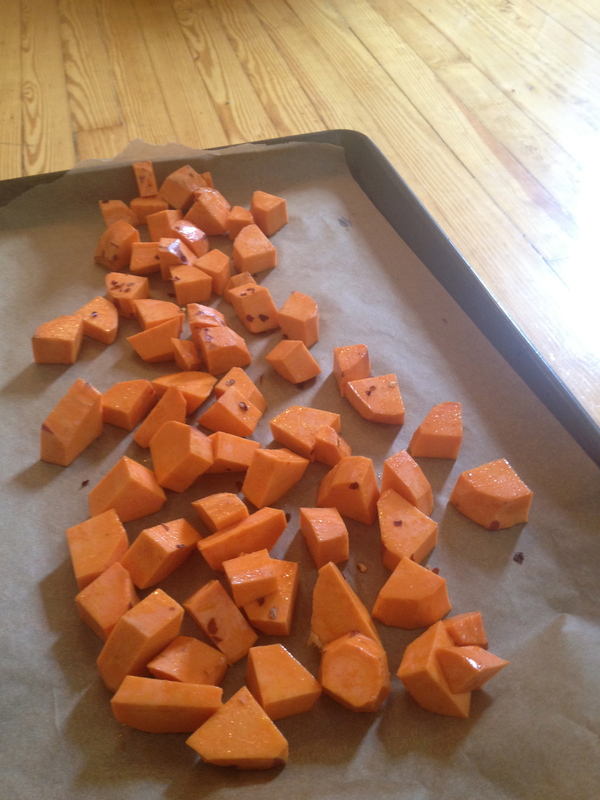 Toss the yams with olive oil, salt, and pepper and place on a baking sheet covered with parchment paper. Bake for about 20 minutes at 350 F.
Make the dressing by combining the oil, vinegar, mustard, salt and pepper and whisking together. Set aside. 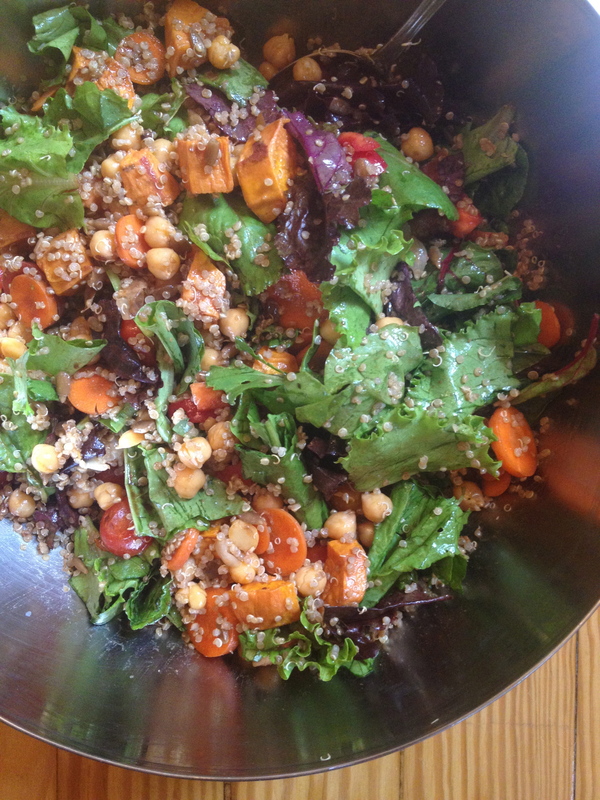 Place the chickpeas, carrots, red pepper, cherry tomatoes, sunflower seeds, greens, and parsley and feta if using, and the cooled quinoa and yams in a large bowl. Pour dressing all over and toss gently. Serve with any number of things: crusty bread, bruschetta, focaccia, grilled fish, olives, etcetera! The salad is also just about hearty enough for a meal on its own.